The Honda CR-V, like most Honda products are default choices for many car-buyers. They don't shop around, they just buy a Honda. That's not to say they are bad products, they are just "safe bets." But the CR-V was lacking some of the advanced safety features of its rivals. The 2015 model fixes that in addition to a few other upgrades. Since we can't all drive Miatas and TDI Sportwagens, sometimes life calls for reliable crossover. Or maybe your non gear-head friends ask you, "Hey what do you know about the new CR-V?" 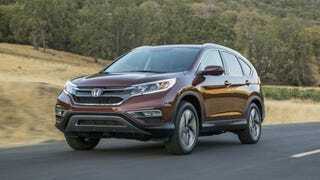 Here is a run-down on all the improvements to Honda's best selling CUV. Pretty much the same as the last one. Though Honda claims the new grille, wheels, and stance (yeah I said stance), gives it a more upscale look. It is certainly more cohesive and cleaner than the RAV4, which I think took a step backward in design. The interior is also refreshed and jazzed up a bit with some faux-wood trim and an all new 7 inch touchscreen display. Honda die-hards will appreciate that all the controls are still within reach and easy to use. Honda has upgraded the motor using by using the Accord's 2.4L "Earth Dreams" engine; output remains the same at 185 horsepower, but the VTEC will kick in a little earlier due to an increase in torque to 181 ft/lbs up from 161. Though the biggest mechanical improvement is the switch to a CVT over the dated 5-speed automatic. This should result in a slight bump in fuel economy; Honda claims 29 MPG combined for FWD models and 28 MPG combined for AWD models. This is where Honda was falling short compared to offerings from Subaru and Nissan. Since most mainstream compact crossover drivers don't really like to "drive," it is crucial to offer features that remove some of that stress. Those buyers will want to spend the extra cash and get the Touring trim that comes with the driver-assisted technology package. This includes: lane departure warning, adaptive cruise control and forward collision warning. It also has Honda's LaneWatch which displays a wide-angle view of the passenger side lane when the right turn signal is activated, as well as Honda's lane-keeping assist and collision mitigation braking systems. Last year Honda sold over 300,000 CR-Vs, making it the best selling crossover and the 7th most popular vehicle. Say what you will about it being a rolling snooze-fest, Honda knows what buyers want. And despite some really good alternatives from Subaru, Mazda, and Nissan, with these upgrades I don't imagine Honda will be giving up that sales crown anytime soon.